I skipped yesterday's post because we actually knew we were having the same thing two nights in a row. When we got home from Indiana on Sunday, I decided to whip up a huge batch of beef stew ... and there was plenty for the next couple dinners. So the thing came out with a definite smoky barbecue flavor. Obviously due to the inclusion of the bbq sauce. But it was nice. I know I've had a couple recipes in the past that have called for hoisin that came out in a similar fashion. But those were a bit more salty and this one was a lot more smoky and sweet. Maybe a little better in my opinion. Anyway, the second day, as to be expected, was a lot better than the first. Stews are just that way, right? 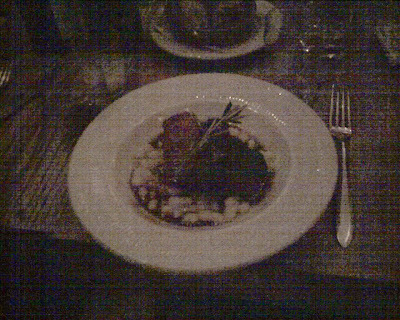 The meat is more tender and the flavors have had a chance to meld. I guess we'll probably call it quits tonight. Probably time for some pork chops ... I wonder how we'll prepare them ... hmmmmmm. This one is going to look a lot like the Thailand recap. Well, the food is going to look totally different. But the format is going to be similar. That's all I mean. Lots of photos, not a ton of description. Sorry. I just needed a break. I did take photos of a lot of food while Meena and I were in Indiana for the holiday ... I just wasn't in the mood for perpetual updates. I made some brussels sprouts for Christmas day and everyone seemed to enjoy them. Nothing serious. Just some bacon and honey and oil and stuff. We also hit some really awesome spots around Indy. We had a great dinner at Puccini's (where I once performed the services of bus boy and salad line dude for a summer) with Grant and Sara. I had a Bar 20 and it made my day for sure. Allison and Meena and I made it down to Yats for some Chili Cheese Etouffee and Jambalaya plates. Man. Why can't NYC have ANYTHING like Yats. If I've missed something and someone knows where I can get a plate of cajun food for $5 bucks anywhere in the Tri-State, please let me know. We also hit Sullivans for some steaks and the University Club for a little fete with friends. So yeah. Some good dining outside of the house as well. To sum it all up, we had a really nice trip home. Mom made awesome food. Dad made awesome food. We hit great restaurants. We drank a ton of wine. I even made a few things. On the way there, Meena said, "I'm hungry" as we were getting on the plane at LGA. My response was, "Have you ever been hungry in Indy?" The answer is no. Never. Food is a big deal at home and Mom and Dad made sure everything was as it always is ... delicious. Well I wouldn't say I missed it, Bob! Remember that quote from Office Space? I love that movie. Anyway, yes, I could have cooked last night and I probably should have but it just wasn't in the cards. Meena got home before me and she had a mind only for Zaytoons. And I couldn't argue with it. I just wanted to eat when I got back. Cooking was off. The mix was a little weird. No pickles last night. So strange. It's always different. I guess I can't argue with that. I like to be surprised. And I like everything in the mix. So different proportions on different nights are OK by me. Not Meena. But I'm OK with it. Anyway, food was good. I might not be doing much of any dinner tonight. I have an office party. So I'll try to get this updated but I haven't a clue what my content is going to be. Winter is here and we're eating chili again! Last night Meena was at an event so I came home and got rollin' on some chili. I hadn't made it since last year so I guess my skills were a bit off. I felt like I was wandering around in the dark (and the results might have revealed that), but I think it was probably OK. I guess in the end I could have used some more beans. Chili isn't chili without a bunch of beans. 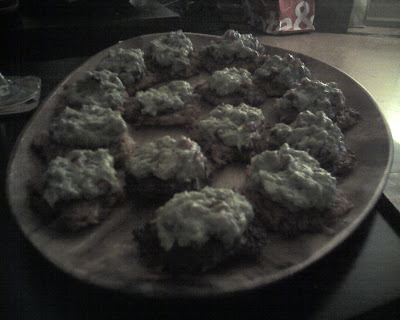 The bacon was only there for flavor ... so I guess this was mostly meatless. And I could have probably used some more meat. But this version didn't make me feel as bad about having two bowls. I also made some croûtons ... just a bit of peasant bread and some parmesan. Simple. But nice. So ... not bad. It probably wasn't my best effort to date, but it wasn't bad either. I guess that if this weather keeps up, I'll get a few more chances. And hey ... who knew I'd get a chance to make something homemade this week?!? Yeah, get ready, folks. We have a week from hell and we're going to be REALLY busy. We have some event or party or something every night of the week. But we'll persevere and by the end of the week, it'll be time to go home and have some fun holiday time. Delicious. The salad was especially good last night. Really nice vinegar bite and SUPER spicy. Like ... my mouth was on fire last night. And it was awesome. We'll try to work in a home cooked meal one day this week but I just don't think we're going to have a lot of opportunity. We'll do better Christmas week. Promise! Well, leave it to Dan to just knock it out of the park with a spread of appetizers and nibbles. He truly excels in this medium. He makes stuff that I find myself craving often. And I know not how to make any of it. I need him to give me some lessons! Anyway, after my haircut yesterday afternoon, we went over to Park Slope to watch a little American footie and enjoy Dan's culinary wonders. 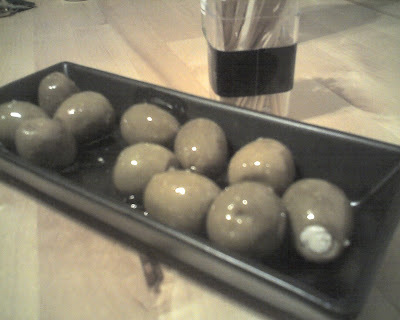 We were also treated to some bleu cheese stuffed olives that were sinister. Everything was pretty outstanding. 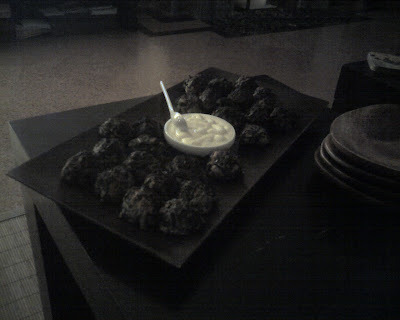 I'm such a massive fan of the spinach balls. Dan has been making them for the last few years and they're always gone in a matter of minutes. It's a closely guarded Strassburger family recipe ... but one day ... it will be mine! Just kidding. Awesome treats, Dan. Thanks for putting your blood, sweat and tears into this one just to make sure we ate like kings and queens during the dwindling days of football. I'm the king of garbage it seems. And you know what? I don't even mind the title. 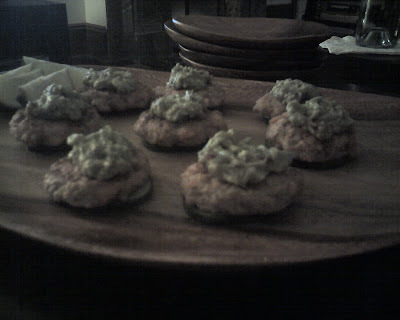 I'm resourceful in the kitchen and I like to use up stuff and try new things to see what comes out. I'm usually SORTA successful. Not always. But a large part of the time I end up with something mostly edible. I wasn't expecting much but this came out SO GOOD. Like, I want to eat this again right now. I want to eat this every day. It's one of my new favorite things. Look to see this one make a repeat appearance on MOAP. After the big surprise, Meena and I had James and D over for a bit of dinner and some highly competitive sport on the good old Wii. The games consisted of horseshoe toss, skee ball and trivia. Oh, and then we did Scattergories later. Anyway, it was fun. Then at the end (and sadly un-pictured) were some really awesome ice cream sandwiches Meena mixed up. A couple homemade chocolate chip cookies surrounding a scoop of chocolate swirl frozen yogurt. AWESOME. Like. So good. Meena knocked it out of the park with the cookies. Totally on point. So it was a fun night. Good food. More great friends (what a weekend thus far, right??). I'm not typically a big fan of surprise parties, but when Meena and I rolled into the Vinegar Hill House on Friday night and a handful of my very best friends were gathered in the entrance, I can't say I was disappointed. At all. It was great to see everyone and even though I'm not much on birthday celebrations, if this is what it takes to have an awesome meal with awesome friends ... then so be it! So yes ... Vinegar Hill House. Quite the buzz about this one so I was very excited to be in the house. I'm told these are the same dudes who do Freeman's ... so you know, there's some cause for excitement. I have to apologize for the photo above ... pretty awful. But it was dark and I didn't have anything other than a camera phone. But like I said, it was a surprise party, so that's my excuse for not being prepared. And we all shared some sides of sweet potatoes and brussels sprouts. I guess in the end I wasn't all that blow away by the meal itself. My pork was a bit dry and the sprouts were a tad mushy. The sausage wasn't what I expected, but I can't hate. It was very good. Meena's chicken was the stand out for sure. I stole a few bites and loved every one. Her mussels were pretty rad as well. I have high hopes for this spot and I'll be back for sure. It's new and you know how that is. But the setting is lovely and for the moment, the BYOB will keep loads of people coming back for more. Couple things here - first and foremost, I forgot to mention that Meena made me a delicious cake the other night for my birthday. Although we're really celebrating tonight (Friday), she unveiled her masterpiece on Tuesday night and I've been enjoying it all week. It's beautiful, no? I thought so. The cake was banana and the icing was cream cheese. It was ALL made from scratch. No mixes or cans of frosting. Meena gets it DONE. Anyway, that was Tuesday. Last night, Meena was at work until late so I was on my own. I didn't really want any delivery or anything so I went ahead and just used what I had in the fridge - which wasn't so bad this time around. NOT bad. Not bad at all. I wasn't expecting much for some reason. But it came out OK. To go with some 30 Rock and The Office? Can't imagine how it could have been much better than this! I had a sales meeting yesterday for most of the day and the whole thing concluded with a group dinner at Il Cortile in Little Italy. I hadn't been to Little Italy in literally ... four years. But it was for work and I was hungry and ... well, I had to be there. It's always fun to be out with coworkers after a long day of meetings and have a few drinks. This is a weird economic time so it makes things sorta strange, but everyone was in good spirits and there was plenty of wine. So there's that, too. Anyway, I had a bunch of assorted things that came around as starters. Calamari and meatballs and eggplant. Bread. Etc. Then we moved into a pasta course. 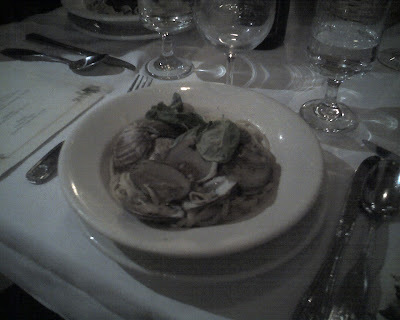 I had linguine with clams. It was pretty jam packed with garlic. It wasn't the best I've had in my life, but it wasn't terrible by any stretch of the imagination. We moved into a salad after the pasta and it was the saltiest thing EVER. Like each leaf was encrusted in salt. I ate a bunch of it but I shouldn't have. 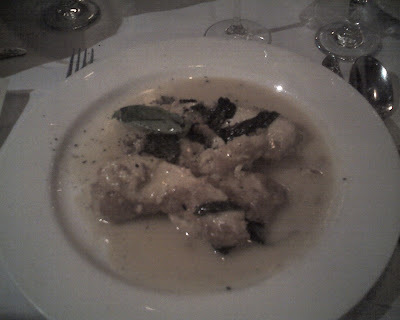 Our main courses were next and I went with the chicken in a lemon and wine sauce. It was chicken with lemon and white wine. I figured it was going to be safe and it was. Can't ask for much more than that when eating with 35 other people or whatever. We rounded out the evening with espresso and some type of cake and it wasn't bad. The espresso. I didn't really get into the cake. So that's that. Another sales meeting in the bag. Go team! Although we're going to go out and hit a mystery restaurant for my birthday later this week (Meena won't tell me where we're going), for my actual birthday, I decided I wanted to keep it simple and close to home. Bottle of wine and Zaytoons. For a Tuesday birthday, I can't imagine anything better than that. We had a nice 2005 syrah from France to go with everything. I love syrah. Anyway, it was a really nice dinner. Zaytoons was packed. We ate slowly and sat for a long time. It was exactly what I wanted. Perfect. Monday. Back in the grind. After our first day back in the saddle, Meena and I had to run around our frozen neighborhood to pick up a few things. When we finally rolled home, I got a few things going for a quick Monday night meal. Meena then whipped up a box of some couscous and I threw the kebabs over it. Not bad. I probably cooked the meat a little too much. Not the end of the world, but not ideal. I did a couple test slices and thought I had it right, but didn't, I guess. It was still good. Just not perfect. So that was that. Nice little Monday night meal. Not perfect but pretty satisfying. Well, we've been to Milwaukee and back. Again. For the second time in a week! And guess what? It was so much fun! Save the airport bouts, and even those weren't that bad this time around, we had a blast from start to finish. From some really amazing foods and symphonies to bad airport food and Joya, we crammed a lot into a few short days. We started in the airport with some cheap Chinese and nasty Italian. Meena wasn't in the mood for the standards so she got the spaghetti. Saturday, we started out our awesome night with a lovely spread at the Wisconsin Club. The whole fam came out and we all ate and ate and ate. The food was fantastic and the company was even better. There were lots of other great things. Brian had a crabcake and rock shrimp ravioli. There were lots of steaks around the table. There was shrimp cocktail for the table. We had a banana cake at the end. I mean. It was pretty awesome from start to finish. And then we got to go to the symphony! And it was one of the best years yet. When we finally made it back to Brooklyn, it was late (delays in LGA, go figure). So what do you do in times like that? You order Joya. I'm not sure why the woon sen is so awesome, but it is. We never saw it on a menu in Thailand when we were there, but man, it's my favorite Thai dish in America. Super spicy, a little smoky and so, so delicious.